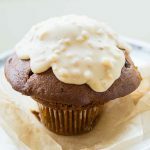 This gluten-free apple streusel muffin is moist and deliciously flavoured with apples and cinnamon. You would never know that this is a gluten-free muffin. 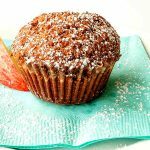 The muffin has apples throughout with a delicious cinnamon streusel topping. When it comes to fall baking, this gluten-free apple streusel muffin recipe is a winner. Enjoy! 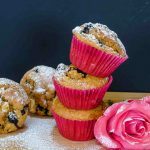 In this award winning gluten-free blueberry apple muffin recipe, the blueberries combined with apples make a tasty combination adding moisture and the right texture. 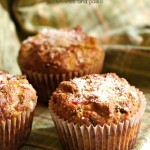 These mouthwatering muffins are high in protein, fiber, and antioxidants and are also vegan. Last time I made these amazing muffins for my family, they were fighting over the crumbs. Enjoy! 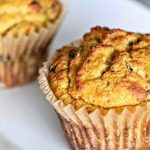 Tired of basic gluten-free muffin recipes? You should then try these savoury gluten-free vegetarian pizza muffins. When a muffin tastes like a pizza, it surely is a winner! This pizza muffin is quick and simple to make. Enjoy! Here is a muffin recipe that is served as a dessert. 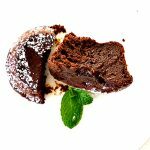 For chocolate lovers, this gluten-free chocolate lava muffin is a must try. This muffin is light with a gooey chocolate center. This is a stunning dessert that will satisfy anyone’s chocolate craving and impress your guests every time. Once you prepare the batter, all you need is ten minutes of baking time. I have made this dessert many times, and each time it has been a big hit. Serve as is or with a dollop of cream or fresh berries. This muffin is amazing!